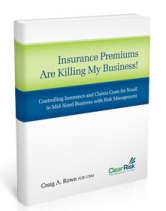 Insurance Premiums are Killing my Business! - Understanding insurance: premiums, market cycles, loss ratio, & rating. - Getting to know your broker: services offered and how they can help your business. - Assessing risks of your business: what is risk, and how do you identify it? - Implementing risk management best practices: insure to value, ACV vs. replacement cost, and more! This ebook is written to help small-to-mid-sized businesses better understand and formalize their organization’s risk management processes and procedures. Every business is already managing risk, as best practices evolve over time to ensure incidents don’t happen. Once you realize this, formalizing your organization’s risk becomes natural. Receive Your Free Risk Management eBook!